As the second largest country in South America, Argentina is both a good source of international students and an attractive study abroad destination. It has a long tradition of higher education, but debate about how to structure and maintain that system is central to the country’s turbulent politics. Today, ICEF Monitor speaks to various international education professionals in Argentina and examines the Argentine Republic, its education sector and students, and its viability for international educators and agents. Argentine education can begin as early as a child’s first year, but only becomes compulsory at age five. Primary school begins at age six, thus a mandatory year of pre-school serves to prepare children for entry into the national education system. Typically, however, most children enter pre-school before age five. Secondary education is split into three years of ciclo básico (basic cycle), followed by three years of ciclo orientado (oriented cycle) divided into specific areas of focus such as social sciences, natural sciences, arts, and others. Upon successful completion all students are automatically eligible for acceptance to public universities, with no admissions test required. For many years, Argentina’s Education Ministry has prioritised universal access to secondary education, and enrolments rose 8% between 2001 and 2010. Looking farther back, in 1950 a mere 10% of eligible students attended secondary school compared to more than 90% today. In the tertiary sector, Argentina boasts 124 colleges, universities, and technical institutes. The country has the largest enrolment rate in Latin America, with an estimated 2 million students in attendance. The majority attend public institutions, which normally don’t charge tuition for their bachelors and associate degree programmes. While Argentine universities score well in regional rankings, the national education budget is at just above 6% of GDP according to Ministry of Education figures – higher than many nations in the region but well behind most OECD nations. 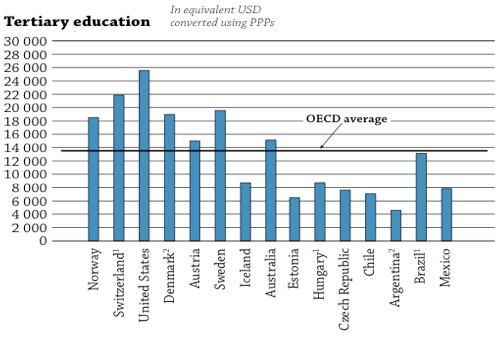 Argentina’s annual per-student expenditure by tertiary educational institutions is also low, as shown in the chart below comparing OECD nations. The dropout rate in Argentine universities is high, and is a subject of debate in the country. Many sources suggest the rate is as high as 73%. Joseph S Tulchin and Allison M Garland’s book Argentina: The Challenges of Modernization cites a cumulative 80% rate. These figures could hint at a lack of preparedness for university, and a 59th place ranking (of 65 nations) on the OECD’s PISA tests of educational attainment seems to at least partially support that notion. Despite the dropout rate, education enrolments in Argentina are rising. In addition, the country has increased its international recruitment activities, particularly within the region, and has seen a rise in popularity among students from outside Latin America. As in many other countries, links between higher education and the private sector have increased in recent years. For example, last year Education Minister Alberto Sileoni presided over the creation of the University Network for Sustainable Solutions and the National Road Network of Universities Petroleum, designed to train students for work in the petroleum sector. Between 2006 and 2013, the number of foreign students in Argentina in undergraduate and postgraduate courses doubled to an estimated 50,000, according to the Secretariat of University Policies of the Ministry of Education. About a third of those students are from Colombia, and two thirds are from Latin America. The students are also attracted by the quality of the schools and the city of Buenos Aires, where more than 60% reside. Many work to cover expenses and are able to strike a balance with their studies, however while public schools are tuition-free, a high inflation rate is driving up ancillary costs such as rents and prices for everyday commodities. The Institute of International Education’s most recent Open Doors data confirms the growing US presence in Argentina. During the 2011/12 academic year 4,763 students from the US enrolled in classes in Argentina, up 3.8% from the previous year, making it American students’ eleventh most popular international destination. MBA programmes are the preferred study paths for these students, but courses fitting under the umbrella of Educational Tourism – everything from the aforementioned Spanish immersion to tango classes – also attract large numbers, particularly from Europe and the US. While undergraduate classes are typically free, most graduate programmes require students to have funding in place to pay for tuition fees. Nearly all classes are conducted in Spanish. Depending on the school, students may need to show Spanish proficiency before admittance into a course. The Argentine government also requires international students enrolled in graduate programmes lasting more than 90 days to obtain a student visa. Typically, important documents related to obtaining visas are required to be in Spanish, and in the case of longer visas, students are often asked to pass a criminal background check. What type of students come from Argentina? However, she added that Argentines are used to overcoming obstacles, and students who want to study abroad often find a way. The most recent mobility data from 2010 shows that more than 9,000 did exactly that, with the top destinations being Spain, the US, Cuba, France, and Brazil. Most needed scholarships, and since 2012 there has been a government grant available for those studying STEM disciplines. The majority of Argentines enrolled abroad are in graduate degree programmes, and the most popular fields of study are engineering, law, and business. Interest in intensive English programmes is on the upswing, and Argentines already possess the highest level of English in Latin America, with the country ranking 19 of 60 global nations in the third edition of Education First’s English Proficiency Index. Last July, ICEF Monitor interviewed Gustavo Viale, CEO of InterWay Educational Consultancy based in Buenos Aires. He described the outbound mobility of Argentine university students as constantly increasing, gave important hints about how to tap into the Argentine market, and offered indispensable advice about how to build links with local recruitment agencies. That interview is available here. Argentines also possess a high level of tech adoption, and those entering university are increasingly conversant with computer technology, partly via a government programme called Conectar Igualdad. Launched in 2010, Connectar Igualdad distributes netbooks to students and teachers at public secondary schools, teacher training colleges, and special education schools. Minister Sileoni has described Connectar Igualdad as “digital inclusion,” or a way of fostering equal access to technology and the Internet. This massive programme distributed more than 3.5 million netbooks to 8,800 public schools in Argentina by the end of 2013, and as an extra reward for students, they keep the computers permanently once they graduate. Educators and agents should be aware of certain challenges associated with working in Argentina. Of special note are those related to the secondary sector, a major source of prospective international students. In recent years that sector has endured broad student protest, and even defiant occupations of high schools lasting for many days. At issue is the New Quality Secondary School (NESC) reform, which beginning this year aims to streamline national curricula from 158 areas of specialisation into ten broad categories. Students believe that removing specialisations will narrow their future employment prospects, but the government feels pressured to improve PISA scores. Also in the secondary sector, recent years saw teachers staging a series of salary strikes resulting in many lost school days. An agreement was finally reached at the end of March when the five national teachers unions agreed to a 28.7% across-the-board pay raise, a substantial hike until one considers the country’s even annual higher inflation rate. Demonstrations and political gatherings occur regularly around Argentina and affect movement, particularly in Buenos Aires. With inflation pushing consumer prices and utility costs up, more protests are likely. Those wishing to work in the country should keep abreast of current events. Safety – after a wave of violent crime and mob justice, the government declared a state of emergency in Buenos Aires in April. The robbery rate is the highest in Latin America. Corruption – Argentina is tied for 106th place on Transparency International’s Corruption Index of 175 countries. Though Argentina is a complex market and the economy is poised at a delicate moment, the country’s population means opportunities exist for educators and agents. For further research, please explore the list of useful resources below. Dirección Nacional de Gestión Universitaria – lists legalised diplomas and certificates as of January 2012. Ofertas Grado – joint website with the Ministry of Education containing information provided on pregrado, grado and posgrado programmes offered by the relevant institutions. Estudia en Argentina – government website offering extensive information on studying in Argentina. CONEAU – includes search engines for accredited grado and posgrado programmes. Titulos Oficiales – search engine for titles recognised by the Ministry of Education. Scholarships Argentina – lists 30 partial scholarships to international students interested in learning Spanish in Argentina. Instituto Nacional de Educación Tecnológica (INET) – hosts the Catálogo Nacional de Títulos y Certificaciones de Educación Técnico Profesional, which is an overview of government-recognised certificates and schools for the technical sector. This entry was posted in Agents, Argentina, Higher Education, K-12, Language Learning, Regions, South & Central America, Vocational and tagged scholarships for foreign students, STEM degree, Becas scholarships, postgraduate student recruitment, study abroad.